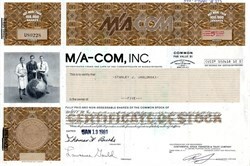 Beautifully engraved uncancelled stock certificate from M/A - Com, Inc. issued in 1981. 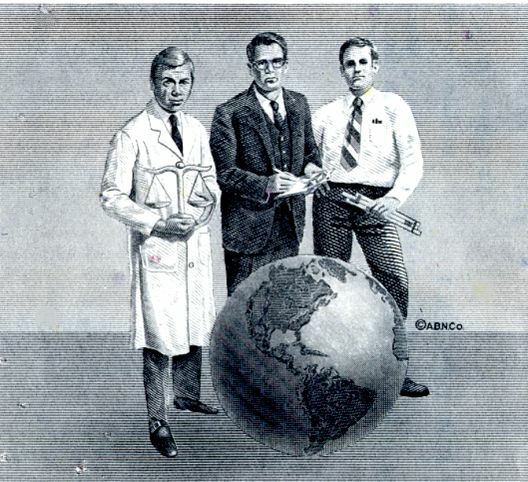 This historic document was printed by the American Banknote Company and has an ornate border on the left and upper-side with a vignette of three modern men of a hard-science profession standing next to a large globe. This item has the printed signatures of the Company�s President, Lawrence Gould, and Treasurer, Thomas F. Burke; and is over 30 years old. M/A-COM started in 1950 as Microwave Associates, Inc. and has grown phenomenally ever since. With a strong history in the semiconductor business, Microwave Associates expanded its horizons in the 60s and 70s through acquisitions and new technology, officially changing its name to M/A-COM, Inc. in 1978. During the 90s M/A-COM reinvented itself again, becoming less and less defense business oriented and more and more commercially-focused. M/A-COM also broadened its technology and market approach to include wireless systems, in particular private radio networks. Now part of Tyco Electronics, M/A-COM continues to excel in cutting-edge technology. History from Wikipedia and OldCompany.com (old stock certificate research service).